I've seen some of these guys' work out in the aether but my buddy Ian recently tipped me off to Spiky Rat Pack. 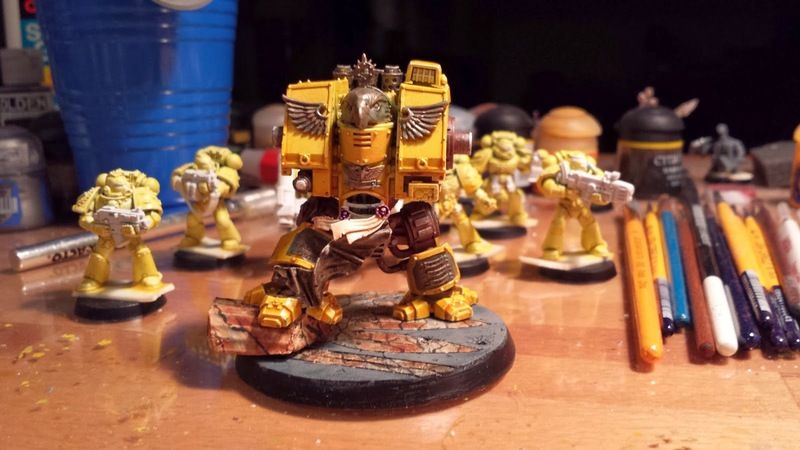 It's got everything you'd want in a 40k blog - high quality painting, ridiculously imaginative miniatures that evoke the late '80s GW style, and a cool punk aesthetic. You should check it out. Be sure you don't miss the Punk Moth posts on there. And here's a tutorial I'll be using to paint some creepy white Bloodletters. Stop reading this blog, go read that blog. It's a nice day to work from home, and by work from home I mean work on miniatures, from my home. 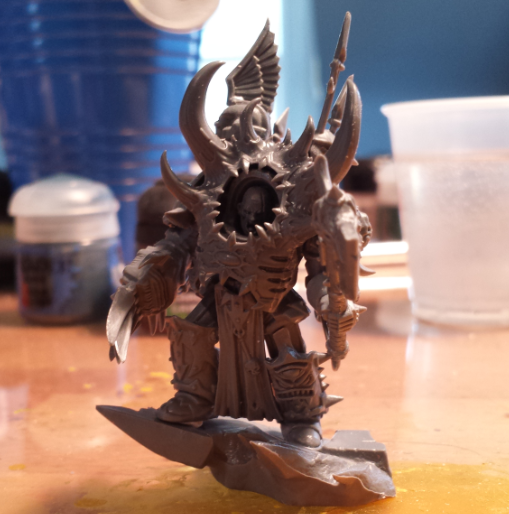 Time to work on the Word Bearers for a few weeks before the grim reality of Novacon '14 preparation sets in. I was pretty sure I was going to have a good time at Adepticon 2014, but the event exceeded my expectations. I'll start out by reporting on the PAGE delegation's Team Tournament results, as they need to be stated (for posterity) but if you are reading this they're probably the thing you're the least interested in. Our collective team record was 5 and 5, respectable for a bunch of guys with our general approach to the game, and overall we came in 59th out of 120 teams. That's just enough to make it to the top half of the rankings despite our perfectly neutral battle scores, so we must have done well in terms of appearance and theme. I'm very happy with these results. Personally (and this is not really an accurate indicator of anything, since it was a team tournament, so I won't take too much credit, it's just the way things shook out) I went 4 and 1. I'm really happy with that. Even better, I got plenty of compliments on my Imperial Fists. All in all, I think PAGE had a fantastic first year. I've been to a fair number of gaming conventions, and Adepticon was by no means the biggest, but it might be the best (although as the NOVA Open grows, it's going to give the Chicago folks a run for their money). I spent the entirety of Friday - and I do mean the entirety - painting in the hotel room, so I didn't really get a chance to take a good look at the convention until Saturday morning as we entered the main hall to set up our armies for judging and prepare for round 1. To my relief, there were plenty of clubs that didn't have elaborate 6-foot-tall display boards. but there were some that did, and they were truly impressive, including a Tyranid hive ship that towered at least 5 feet in the air above the army display (complete with a working water pump to represent syphoned biomass). Most importantly though, the room was full of a fantastic atmosphere that lasted the entire weekend. You could really just walk up to anyone and start chatting about their army, and freebies flowed like wine. One player in example had an interesting scratch-built army, and I complimented him on his miniatures. 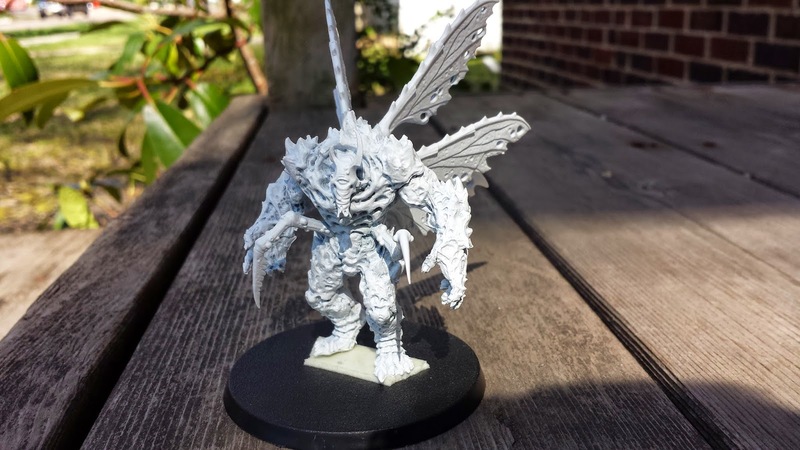 He turned out to be associated with Troll Forged Minatures, and I walked away with a sample model that will someday find its way into my no-longer-secret Chaos army. I didn't run into an unpleasant person all weekend. There are times when I take a step back from the hobby and think, "wow, I put a lot of resources into toy soldiers," and I think it's good to keep things in perspective, but Adepticon was a rewararding experience and it was cool to be part of the good energy that came from a bunch of people coming together to celebrate common interests. I'll move on before I get too sappy, but to summarize: if you haven't been to an event like this, you should do it at least once. The Team Tournament took up most of the weekend, so I didn't get to take advantage of any demo games the smaller, up-and-coming studios were hosting, but I did get to see a bunch of new games in the dealer hall (which was fairly small, actually). The years to come are going to be interesting for tabletop gaming. I've always agreed that Games Workshop has the best miniatures in the industry, bar none. 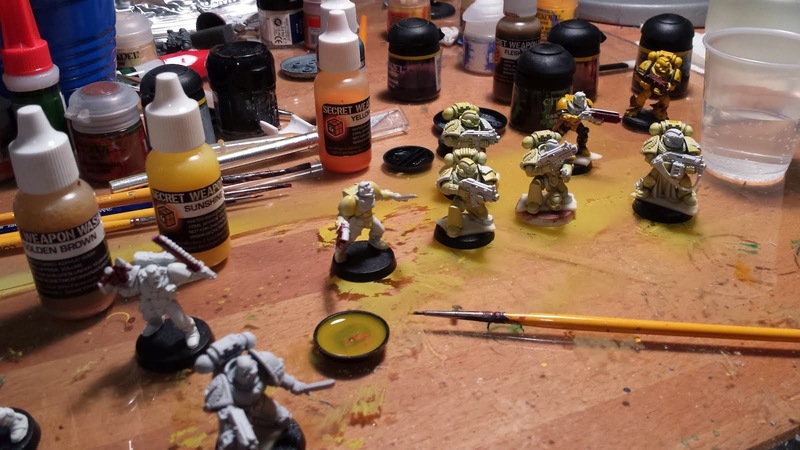 I think that is still generally true, by virtue of the vast scope of GW's model ranges and their ease of customization, but in terms of raw quality, the gap between Games Workshop and their competitors is shrinking rapidly. I was particularly impressed by the stuff for Wild West Exodus and Mantic's Deadzone. I'm still a Warhammer 40,000 loyalist (double meaning fully intended), but it's a good time to examine secondary game systems. Side note: why does Games Workshop seem to be the only company that encourages conversion and customization? If there was another system that lent itself to conversion on the scale of 40k, that would go a long way toward winning my hobby heart. Secondary side note: I spent less than $100 on new toys at the convention, which might be even more impressive than our team's standings. Unfortunately ~$40 of that was the Tempestus codex, which was not in any way a good value for money. Good people, good times, super fun, A+. I was too busy to properly document the event but you can see a handful of pictures on flickr. I'm still gathering my thoughts and trying to acclimate to real life after the parade of spectral visions that is Adepticon. In the meantime, since the judges didn't read the background stories I wrote for our armies, here they are for your viewing pleasure. Lesson learned, and in retrospect it should have been obvious, but next year we'll have to make an effort to do something more visual. Our theme was "The Feast of Terra," a commemoration of the events that transpired at the defense of Terra during the Horus Heresy. I present the following with a good-natured laugh at myself, keeping in mind the time I asked Joe to remove my name from some 40k-inspired fiction from our club's website as it might jeopardize my "serious writing career..."
There has been much wailing and gnashing of teeth in regard to the upcoming Imperial Knight kit, and even if I haven't been at the front of the charge, I have complained loudly and often against the proliferation of super heavy vehicles and D weapons in standard games of Warhammer 40,000. So why am I excited about the Imperial Knight?